A share of £115,000 is up for grabs from a community fund to help make the region a cleaner and greener place. The community fund has been made available for Merseyside and Halton community and voluntary groups, schools, faith groups and not-for-profit organisations, who can reduce household waste, encourage recycling and resource re-use and prevent carbon emissions. The projects will also have to demonstrate wider positive impacts on the environment, health and education. The money is coming from the Merseyside Recycling and Waste Authority and Veolia Community Fund 2019/20, which has been running annually since 2006. The impact of the 2017/18 Fund saw 12 projects deliver 28 full time equivalent jobs (created or safeguarded), participation by 486 volunteers, 29,435 people directly engaged, 1222 tonnes of waste material diverted from landfill and a 1181 tonnes reduction in CO2 equivalent emissions. – using cookery clubs across Merseyside and Halton to improve people’s diet, to reduce food waste and make financial savings. Bids must tackle one or more of the four priority household waste materials which have been identified by MRWA as key, namely Food, Plastics, Textiles and Furniture. An analysis of waste in Merseyside and Halton highlighted that a greater amount of these materials could be re-used or recycled. Projects can also include other household waste materials, for example paper, card, metals. The Liverpool-based Granby Toxteth Development Trust (GTDT) is one organisation to have benefitted from the Community Fund. The project has used the funding to engage residents around Lodge Lane with waste reduction and recycling messages. Dr Lindsey Guy, Chief Executive of GTDT, said: “We have been delivering recycling and waste management projects for several years around the Granby Toxteth area, and recently more further afield. Funding from MRWA and GTDT’s own Big Lottery funding – L8 Living Sustainably – has enabled us to develop a transferable model which works successfully with many different communities and groups. Chairperson of Merseyside Recycling and Waste Authority (MRWA), Councillor Tony Concepcion, said: “We’ve made this money available for new and existing projects which can have an impact on their local community and make Merseyside and Halton a cleaner and greener place for us all to live and work. Interested groups should complete and submit a Stage One form with MRWA. If applicants are shortlisted then they will be asked to fill in a more detailed Stage Two entry. Successful projects will receive the funding in April 2019 and will have twelve months to deliver their schemes. Download the Stage One application form and Guidance at www.merseysidewda.gov.uk/waste-strategy/community-fund/community-fund-1920/. Friday 4th January 2019, 11.59pm. GTDTMRWA_2018a – a family fun day with clothes swap event at St Bede’s church in Toxteth. 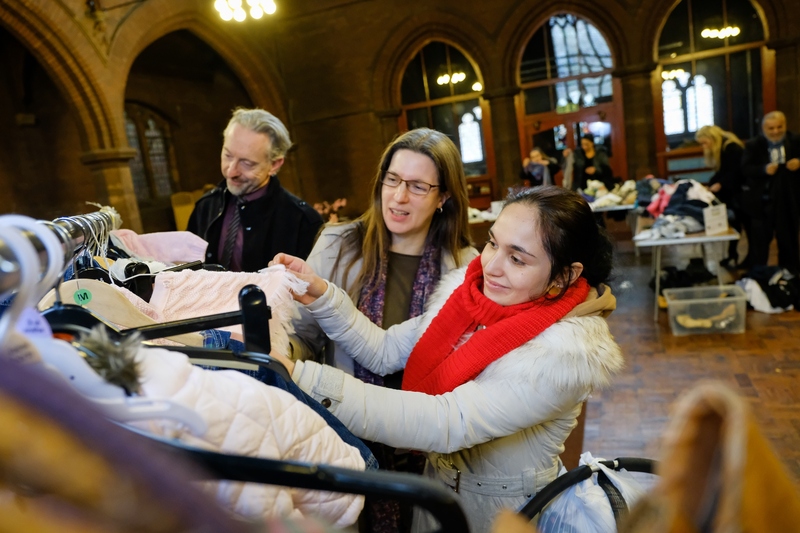 GTDTMRWA_2018 – a family fun day with clothes swap event at St Bede’s church in Toxteth. Left Glynn Stevenson (Waste Policy Officer at MRWA) and Centre MRWA Member Councillor Laura Robertson Collins. The Merseyside Recycling and Waste Authority and Veolia Community Fund is open to community and voluntary sector groups, faith groups, not for profit social enterprises and schools in Merseyside and Halton.